Get ready to feel a bunch of chills running up and down your spine once you settle in to watch "Most Haunted." Of course, the catch is: are those chills justified? "Most Haunted" is a British TV show that tries to mix a number of genres together, including mystery, reality and documentary. As the title suggests, the show revolves around a team of people who investigate some of the most reportedly haunted sites in the world. Yvette Fielding and the ghost hunting team take on their biggest challenge yet at HM Prison Shrewsbury. First up is the 'A' Wing where something seems to be stalking them. Grade II listed Middleton Hall has a history of paranormal activity. Yvette sees something that shocks her to the core. Oak House is thought to be one of the most haunted places in West Bromwich. One experience changes the belief of sceptic Glen. The team are at Walton Hall in Cheshire where they encounter a disembodied voice, and Yvette gets spooked in the cellar. Strange goings-on have been reported by staff and guests at the Mansion House care home. A poltergeist awaits the team at Halsham House, and there's a creepy discovery in the attic. The team encouter the ghost of a drowned soldier at the once magnificent Whittington Castle in Shropshire. 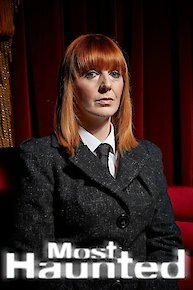 Yvette Fielding and her team of paranormal experts head to the Lyceum Theatre in Crewe, Cheshire, which is known for its paranormal activity. They take the fight right to phantoms that lurk in the theatre's darkness with some truly frightening consequences. The team head to a living museum in Dudley, where a spook wants to chat via the Ouija board and EVP machine. The team face a night of mysterious moving objects at the Old Nick Theatre, where one spirit is desperate to hog the spotlight. The team creep around a cluster of old buildings in Skegness, where moving objects lurk around dark corners and spooky sounds fill the halls. The dark corridors of Cheshire's Hill house reveal a spirit who is desperate to make contact with the terrified team. Will a resident grey lady drain the colour from the team's faces at Carr House? Will a headless jester play a nasty trick? The team sift for spooky secrets at the Armely Mills museum in Leeds, where spirits of its industrial past are said to linger. The team might need a little TLC after their visit to a Leeds medical museum, where a spirit doctor is doing his rounds. Things get physical as the team continue to investigate Yorkshire's 30 East Drive, home to The Black Monk of Pontefract. A supremely savage spook is said to reside at 30 East Drive in Yorkshire. Will the team receive a wicked welcome? Most Haunted is currently available to watch free on Tubi TV, Pluto TV and stream on LIVING. You can also stream, download, buy, rent Most Haunted on demand at Amazon Prime, Netflix, Amazon, Travel Channel, FuboTV online.